David Copperfield – David Copperfield is the story of a young man’s adventures on his journey from an unhappy and impoverished childhood to the discovery of his vocation as a successful novelist. Among the gloriously vivid cast of characters he encounters are his tyrannical stepfather, Mr Murdstone; his brilliant, but ultimately unworthy school-friend James Steerforth; his formidable aunt, Betsey Trotwood; the eternally humble, yet treacherous Uriah Heep; frivolous, enchanting Dora Spenlow; and the magnificently impecunious Wilkins Micawber, one of literature’s great comic creations. In David Copperfield – the novel he described as his ‘favourite child’ – Dickens drew revealingly on his own experiences to create one of the most exuberant and enduringly popular works, filled with tragedy and comedy in equal measure. This edition uses the text of the first volume publication of 1850, and includes updated suggestions for further reading, original illustrations by ‘Phiz’, a revised chronology and expanded notes. In his new introduction, Jeremy Tambling discusses the novel’s autobiographical elements, and its central themes of memory and identity. 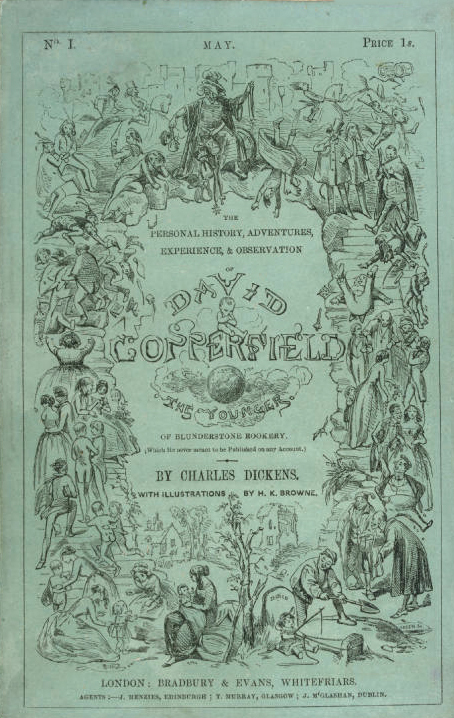 Charles Dickens said that his favorite work of his own was David Copperfield. I’m still partial to Tale of Two Cities, but this is a truly spectacular piece of literature that deserves every bit of its status as a classic. Dickens draws you into his stories in a way that nearly no other author can. In David Copperfield, you truly feel as if you are the protagonist/narrator Copperfield. You feel his pain and enhaltation, you sense his difficulties, mistakes and triumphs before they come through Dickens’ subtle foreshadowing. The other thing that Dickens does so masterfully is create his characters. Dickens’ characters are the stuff of legend for a reason. In anyone else’s hands, characters as vivid and over-the-top as Dickens’ are would be ridiculous, but somehow Dickens writes the colorful characters to be completely believeable. This trick has something to do with the way Dickens develops the characters over time, something to do with the detail with which he describes them and something to do with consistent core of the characters. The villians alone make this story well worth reading and they are just the tip of the iceberg. Read this classic, you’ll be glad you did.